Hi Everyone! I’m a bit late (ok it’s Friday) on getting this week’s psychic exercise out – but it’s been busy around here! For this week’s psychic exercise, use the comment form to write in your impressions. I’m still on the fence as to whether I want to give you the “actual” 3-D reality facts about the image, because I feel you all will learn more by looking at each other’s impressions rather than by what is right or wrong. But for now – here’s the image. Remember to use “I felt” or “I saw” rather than translating your impressions. The raw data is always much more accurate (and often more telling) than your translation, no matter how intuitive you are. I see a man…60’s, I guess. Salt and pepper hair, mid/dark color frame glasses, maybe even tinted a little in the lenses. He has cigarette breath and his clothes kinda smell like it too. And a slight congested dry cough. Hair is more bristly, but short. Navy pants, button down shirt with stripes. Happy guy. When he laughs, he coughs. I can see this guy really clear in my head. Kind of a regular guy. He is telling me that this should be used for basic work. Like “water witching”, making normal decisions…not all the “fancy stuff”. Important but normal life moves…I keep hearing like “looking for water on a farm”. Lungs are hardened…hard to breathe. But happy. Kristen – I can’t verify any of this as right or wrong. The pendulum is mine but I do not know anything about who made it, where it came from etc. So, you could be right here. No idea! I felt a sense of a ship and then a well; something was falling into the well. I felt pain at the top of my shoulders and at the neck line, hot flashes also. I also felt that I was looking at a witch with her black hat. Interesting! The pendulum is mine – and I have been experiencing shoulder and neck pain. Good job. The first thing I got was ‘grandmother/heirloom’, then West (something?) and a brown cat. Then I saw an old kitchen painted green with white trim. It was a bright and sunny kitchen and felt warm and filled with love. I felt spin, fun, wild, different, adventure, and twine. First I thought pendulum,then I saw the word bell & I see a dog witht this. It feels like a toy for the dog. I just saw him bat at it to make a noise. I see a door with it, or see it hanging on a doorknob. I am getting brought to the idea of an animal using it to signal to go out?? I just got brought back to an image of it being held as a pendulum. You are connecting through the pendulum to my energy. We have used a bell to have one of our dogs signal she wants to go out. I think it is interesting that your dog’s name is Bella. Perhaps this is why debbie saw the word bell & a dog with this bell? I see playfull orbs on a linear plane…the way to get from here to there is never in a straight line. The name rachell came to me. Orbs. Very pretty in pink. Heard:Hungarian heritage. Saw: Volkswagon Beetle. Loved an older woman? Age difference? Heard the ‘I’m lookin’ over a four leaf clover’ song as sung by Bugs Bunny. Could see an old man’s hand holding the chain. Heard voices talk about it belonging to him but used to belong to his wife who passed away. Could see a younger person taking a picture of it on the floor of the room where the old woman would enjoy her daily tea and visits from family. Psyched that you’re calling me a younger person Teena! I get the impression of someone who is expecting. However I could also interpret that as someone who is hatching a project that is a big deal and it hasn’t been an easy process. It was purchased in a very spiritual place. Not a church, but a space that is very much like that in some ways. Impression of incense. Belongs to a male maybe? Scuffling of dog nails on the floor around the table. From a church or used at one/something similar to a church–Wicca. Interesting! You are the third or fourth person to read the owner’s energy as male. Even though I am not male- many mistake my Type A energy for male energy. I get a sense of intuition. I see a full moon and a woman looking like a witch. I see someone shaking her shirt/ sweater while wearing it like she has hot flashes, I see a black cat with a neck less with a bell attached to it, a woman using the thing on the picture as a pendulum over a person laying on a bench, a women asking questions while using the thing as a pendulum, I hear a door knirk. I saw a big city on the west coast. I felt ‘doctor’. A light hearted feeling & the chain feeling cold, wrapped around my left hand and cool in the left palm. Coins falling like a waterfall. A portrait on canvas that is black at the top and white at the bottom. Good job. I use my left hand. Not exactly – but I was rushed when putting this picture and image together as it was the end of the week and people were waiting for the next exercise! I see a pendulum that slipped out of someone’s hand n landed on the floor where there was a ceiling light reflection . The way it landed with a point or curve to it seems to be a message that there is going to be a wave of change for someone . It seems as if the pendulums also an heirloom . I also detect that this is an old house with lots of memories . My necked itched as soon as I looked at the photo. I got the words bright, intelligent, enlightened. I’m picking up on male…older. Interesting because my first thought was feminine but then I felt “No try again…keep trying” also 3 kids 2 girls 1 boy. I didn’t know it was a pendulum. Thought of a genie bottle. The shape made me think of a teacher or instructor, instructing. The floor I thought of dancing… I saw eyes that looked jealous looking at the object on the floor. I heard the word ghost. I saw a woman with long narrow fingers clasping the chain around her neck. I feel this belonged to someone who’s passed away. I did not get much from this image. Saw it as a piece of jewelry or trinket new to the owner in their lifetime (not inherited or family heirloom) but with nothing outside of it’s intended use. Seeing it new when acquired. Nothing from the floor or reflected light (camera flash). I’m seeing a bird and the letter E, then the name Elizabeth. The number 81, then just 8. An older woman connected to this as well. I feel something happening in a house. An old fashion house. A mid aged women with curly hair and a bonnet with a french perfume on. A war is going on and there are bombs coming through the window while she is putting on her necklace and she throws it on her vanity and runs. I felt that an older woman was gathering her things and someone was rushing her like something was happening. She was rushed out of the room and she either forgot it or dropped it on the floor. It had a deep sentimental value to her, almost like it belonged to her mother or grandmother. Im seeing the letters S and E. Im getting the names Suzy or Susan and Elizabeth. I see a woman in black. I hear a crack as this item hits the floor. I see a baby. I feel frustration. Candy apples. I had a very surprising experience, Yes, I believe the pendi is Danielles, it gave a positive nod and then the most beautiful gold light, loving and WARM came out and through my minds eye. Comforting and warm. Not something I was expecting. It really was a beautiful gold light. Not the norm for me to see at all. I feel a young girl hated this necklace and took it off as it dropped to the ground. Gift from parent for birthday. I am getting sadness, grandma, gathering & food. The moment I saw the photo, I knew it was your pendulum ! It was picked up somewhere like a flea market or not expensive seeling of items. It doesn’t hold great value monetary or personal but the original owner likes that whoever purchased it was drawn to it because she was lonely at times and feels connected to the owner now. She was a gray haired lady, very sweet and quiet, she’s wearing a heavy cardigan home-made aqua/bluish sweater over a white blouse. She wears glasses and likes to crochet. She’s liking the owner of this piece now. She’s smiling at me to show she’s pleased. i saw a wave, an anchor, started to feel the presence of a child, possibly parents, but strongly the presence of a child. Hemmed in? Anchored between adults ? I felt – spiritual, pendulum, I saw a woman in black cothing, healer, work from home, many clients, almost dark feelings. I do not feel it is used as an actual pendulum for pendulum work anymore. I see a pendulum which is a keepsake, meaningful to the owner. I see/feel it picked up by my left hand. Once I feel like I am holding it be my left hand, my right hand begins to pulse much like it does when I feel a powerful crystal in my palm. While holding it, I also feel sensation through the right side of my body which all draws attention towards the energy pulsing in my right hand. I also felt sensations on and around my neck like when I work on balancing and opening my 5th chakra. I felt a loss, someone lost a necklace that a loved one gave them, but also felt hopeful in time it would be found because there is a little light shinning on it. I see an old woman with long white hair, wearing a skirt, and a female child. I keep seeing a yellow ball. I got a flash of a white bird. I see primarily masculine trickster energy. 🙂 A woman’s left hand rushing through her day. Hear a bell. See a dog and rushing energy. 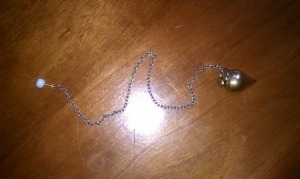 The item is a pendulum and came from a spiritual space…not a church, but has a sacred energy to it. It feels like something is clinging to it and wants to be cleansed…or not. Quite neutral but would “feel” better to clean. When I hold my left hand out I feel weary neck and shoulder dis-comfort…literally lack of comfort and I want to shake that arm…let the blood flow. At first the reflection of the flash on the table put me off…the rushed feeling was not comfortable…and then when I closed my eyes the other stuff came in a rush with the energy. Thanks. I can see what remains after the divination process. Pendulum and white melted candle. I see brown, a girl, a camera, light coming in through a window. I head the sound of a tinkling bell, probably inside the charm in this chain…used at a cat door to alert of the cat’s entering. I felt it’s just down for this exercise and is currently still used. Divining pendulum well used. Flooris more interesting. Lots of people have walked on it. Pendulum may have–feel like it was used to answer pregnancy questions. It’s a girl. Divide is old and has been around about as long as the floor, maybe longer. Handed down, more than one owner feels like feminine energy. I heard that this piece of jewelry is vintage. I saw that the person who uses this (perhaps a guide) is older and wiser. I feel this necklace was very important to someone, I feel a fight occurred, I feel two people were involved and someone ran off, then they took a picture to remember what happened, to figure out why it happened, do I stay or do I go? Hurt, anger, shame, fear, loneliness. I saw sweater chain fell off,a grandmother with glasses,grey hair in a bun, a movie character Mrs.Doubtfire. Sentimentality around this object. Children playing with it. I hear that it represents a timeline and connects generations. I feel a hospital room with bright lighting, a passing over, a spirit anchor. i saw a woman getting slapped, i heard a man yelling, she feels shes not good enough and helpless. I felt much love, like it might be a favorite pendulum and/or that it is used with love. Belongs to woman with long dark hair who is carrying her child in her arms, she is a mother and very spiritual,there is an orb in the picture who is her guide and watching over her. She is very connected spiritually. Just pure love is emanating from this woman. There is a male in spirit watching over her, maybe her father (large man), he appears to be smiling, I feel he is proud of her. i sense a bar/bar stools, early 1900’s, i see a man in a beard, suit. i feel happiness and laughter. Someone lost a necklace on a old wooden gym floor. Formed the letter W…bright light above it reflecting off the floor. I feel very isolated when I look at this object. I feel left out, misunderstood, wanting. It leaves me wanting to be either physically embraced or embraced as the person I really am. The person who owns this once felt like a “nobody”. Christmas? floating…light fixture..Danielle’s home? I feel alive curious …boy on a bicycle riding by…museum?…playing a game …laughter…dinner time…celebration. Grammas table. The fan pull has come down. It seems a shame…for we wouldn’t want to disappoint Gram. I see an elephants head.. I felt a holiday/Christmas ambiance, saw an older woman with kind of short white curly/wavy hair in a chair speaking to a younger woman with very short darker hair on a couch. It looks like an incense burner (type of thing) used at a ritual. I see the pendulum, but I hear the word No. So this means maybe it wasn’t the best gift, or it was a gift from someone who isn’t a friend.